Truffles are the fruiting body from a specific form of fungi, the Ascomycete, that grow underground and are extremely rare. This fungi is highly prized and they are typically very expensive given how difficult they are to find. As we all know they are used for food and are rich in flavor, a flavor that cannot be replicated by any other type of ingredient. 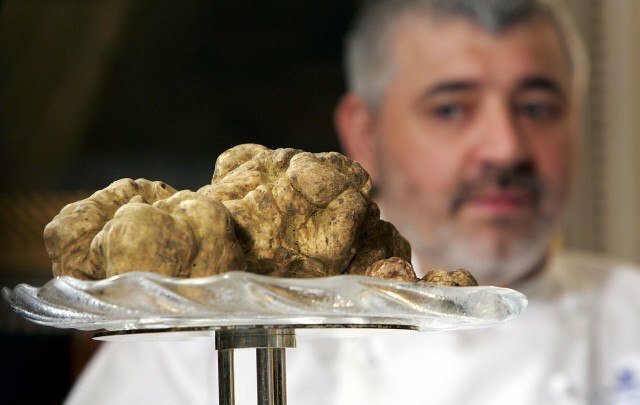 So what are the most expensive truffles that have ever been sold? We are going to take a look at the five most expensive truffles of all time. At 4.16 pounds the first truffle on our list was the largest truffle that has ever been discovered, still despite that fact, it only comes in at number five on our list. This truffle was sold at a Sotheby’s auction back in December of 2014 to an anonymous buyer. Next up we have three truffles that were sold as one in an auction back in 2006. In total the truffles weighed out to be 3.3 pounds and they were sold to Sir Gordon Wu and Lady Ivy Kwok Sau Ping for $160,787 dollar. That comes out to be around $49,000 dollars per pound. Next up we have a 2.2 pound white truffle that was sold in an Italian white truffle auction back in 2008 to Stanley Ho. Ho is a casino mogul and billionaire from Hong Kong who we are going to get familiar with as he also purchased the next two truffles on our list. Stanley Ho strikes again when he picked up a 3.3 pound white truffle in an auction in 2007. He dropped $330,000 dollars for the truffle which means it was worth $100,000 dollars per pound. Finally the last truffle on our list was a white truffle from Italy purchased by Ho in a 2010 auction. While he paid the same amount as the previous truffle, this one weighed 2.86 pounds so it is obviously worth more money by the pound. I’m just curious what Stanley does with all of these expensive truffles. I guess he’s got quite the appetite for them.